This tips for test taking page is devoted to strategies that teachers may employ in their classrooms to encourage students to become more test-savvy. Specific activities are included for your students to help promote the acquisition of efficient test taking skills. These specific activities are available in the form of a PDF document package that may be freely downloaded, if you choose to do so. I think that almost all of us would agree that kids these days are over-tested. But, like it or not, it doesn't look like standardized testing is going to disappear anytime soon. 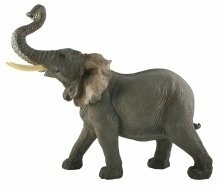 Because student success and even our paychecks as teachers are so firmly tied to testing, testing has become the elephant in our classrooms. I'm hoping that the material you will find here will help you and your kids tame that elephant--maybe even bring him to his knees. Conduct class brainstorming session to find out what students already know about testing. Encourage students to share ideas and strategies that work for them when they are taking tests (reading directions carefully, checking work, etc). Record and discuss these ideas and strategies. Review the list, isolating those strategies that help when taking a test. Display the list and add to it as new strategies are learned. By becoming more familiar with these strategies, students become better able to use them during regular class assignments. Explain the purpose of testing to students. Tell students that test results are one way of determining how much learning is occurring. Explain to students that on some tests like the NRT's, they are not expected to know everything on the test and that some questions are designed to stretch student thinking and beyond material previously taught. Provide grade level experiences in the use of testing materials. 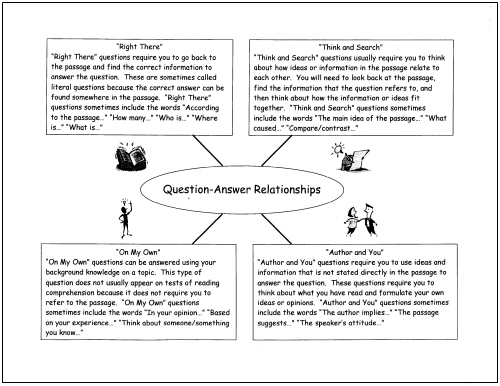 Remind students that when they are answering questions that relate to a reading passage, they should always go back to the passage itself when they are in the process of selecting an answer choice. 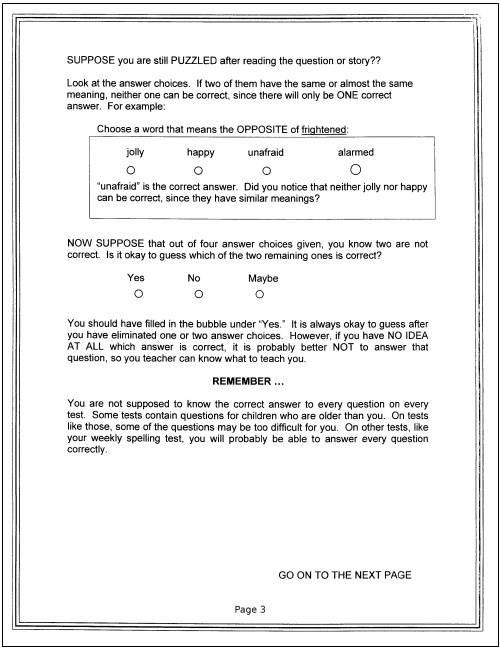 Provide practice using answer sheets in daily or weekly work. Help students learn to cover answer columns not being used on multi-column answer sheets or booklets. This may help to avoid errors and confusion. Instruct students to compare question numbers with corresponding answer spaces as they work through the test. Demonstrate and practice using place markers, such as, rulers or paper markers. 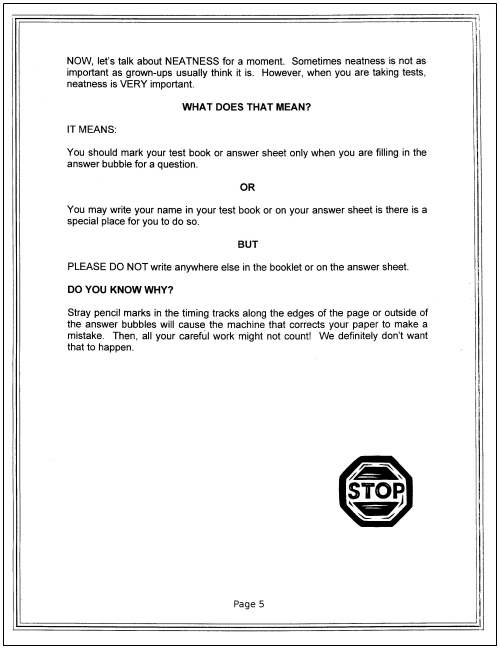 Explain and demonstrate the mechanics of appropriately marking answer sheets/booklets. Tell students why they must be well marked. Please see guidelines for marking answers below. Some tests (most classroom tests or district-developed tests) are not timed and allow students to work at their own pace. However, other tests like the NRT's and standardized state tests are timed, and these time limits may be troubling to students who lack experience with timed activities. When tests are timed, students may become anxious. Teachers can minimize this anxiety by giving timed exercises during routine activities. Here are some activities to consider using with your students to help them better develop their time awareness. Have students sit quietly with their eyes closed or heads down on their desks for two minutes. Ask students to raise their hands when they think two minutes have passed. Discuss how long the time interval seemed. Next, have students play a game or fun activity for two minutes. Compare the two timed intervals. 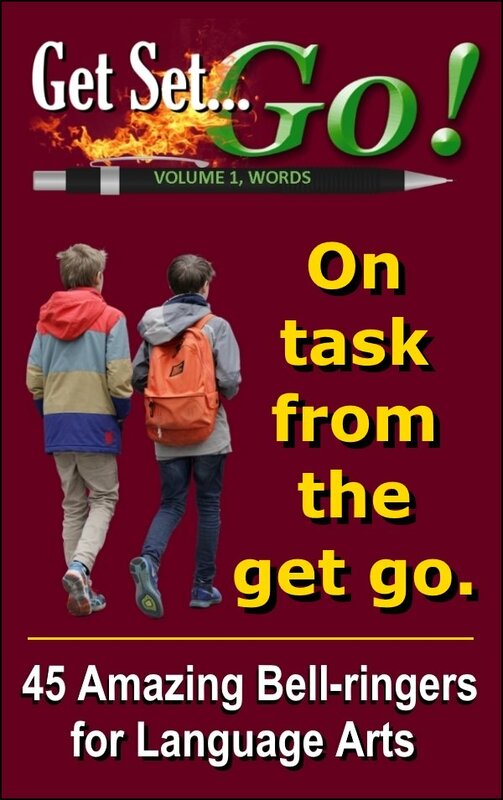 Lead students to awareness that time may seem to go more quickly when they are involved in a task. Set a timer for one minute and have students sit quietly until the time is up. Discuss various tasks that might be accomplished within a minute period, such as writing one's name, solving a subtraction problem, etc. Increase the time as the students' concept of time improves. 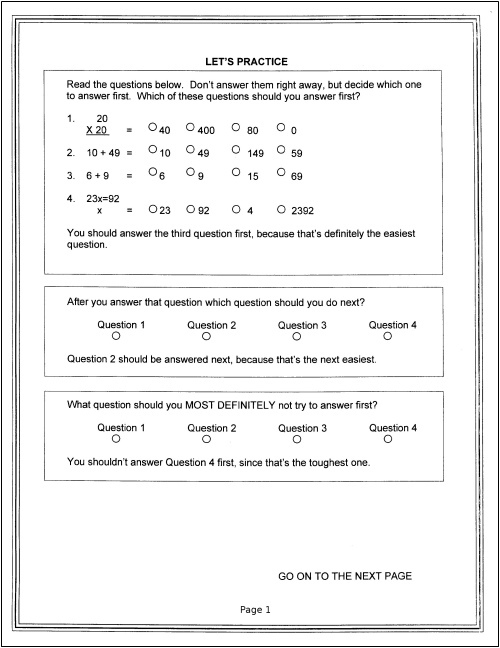 Give students practice in taking timed tests of various lengths. 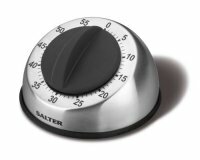 Applying time limits on everyday lessons/activities can assist students in gaining confidence with timed tests. Pose a problem for students to process within a set time. Pose another problem for students to	process without any time limit. Have students discuss how they worked on each problem. Were there any similarities or differences in how they approached the problems? Give students one minute to work on problems/questions. After a minute, ask students how many items they answered. Record on the board the number of items completed. Continue working for another minute. Discuss the number of additional items students were able to finish and why. Then allow students to finish, writing down the finishing times of individual students. Discuss the differences in finishing times (different students work at different paces). Discuss why some items took longer to complete (longer to read, more difficult questions). Tell the students that when they are taking a test, one way to pace themselves is to go through the test one time and answer the easy items. Then, they can go back to the beginning and go through the test again, this time working on the harder items. doing the easiest problems/questions first. going back to the harder ones and doing them in order. leaving a difficult question if it is taking too long. Explain to students the importance of having a positive attitude. People can make themselves succeed or fail. When students make up their minds to succeed, they usually do. You CAN motivate your students to do well and to not give up. An interesting example about persistence that you may want to share with your students is that Thomas Edison tried over 12,000 times before he found the right components for a light bulb that worked correctly. The key challenge for you as the teacher is to explain the importance of the test without raising anxieties. You may want to consider explaining that the test will help you by supplying information about what the student knows about a subject area. But more importantly, it will tell you what skills will need to be remediated. Develop long-range plans to organize instruction. 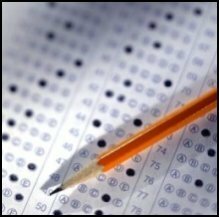 Build student confidence throughout the school year by informal testing. Experiences should be purposeful and correctly related to the curriculum. Review and define words commonly used in test directions. Terminology common to standardized tests may confuse students, but the more experience they have with it, the better they are able to handle it. Familiarity with direction words can help students understand exactly what they are required to do. Such words include, but are not limited to, column, opposite, passage, similarities, supports, completes, web, and selection. A complete set of such terms along with a concise description of each is included in the Tips for Test Taking Package (see below). Instruct students to read directions and items/questions carefully and to read all the answer choices before choosing the correct one. Make it abundantly clear to students that they not only can go back to a reading passage when they are answering questions based on that passage-- they are strongly encouraged to do so. Discuss multiple-choice questions. Suggest identifying the obvious wrong answer choices first to lead them to zero in on the correct answer through the process of elimination. 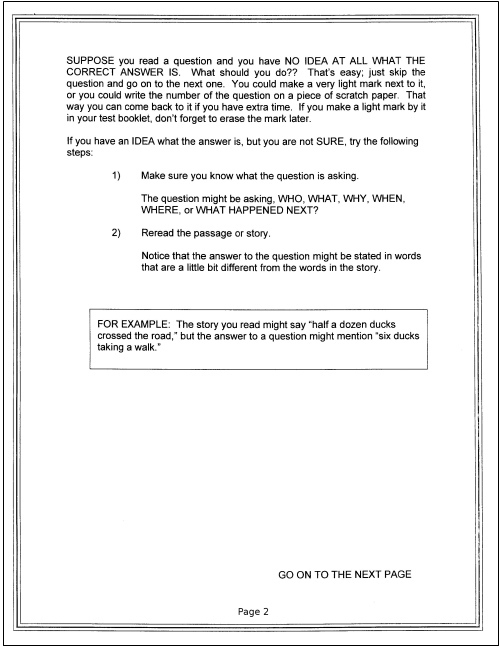 This strategy helps students reduce a lengthy passage into a comprehensible and manageable size by marking the text using a systematic technique. On the FCAT, Florida's standardized test, students are allowed to write on the passages to be read. 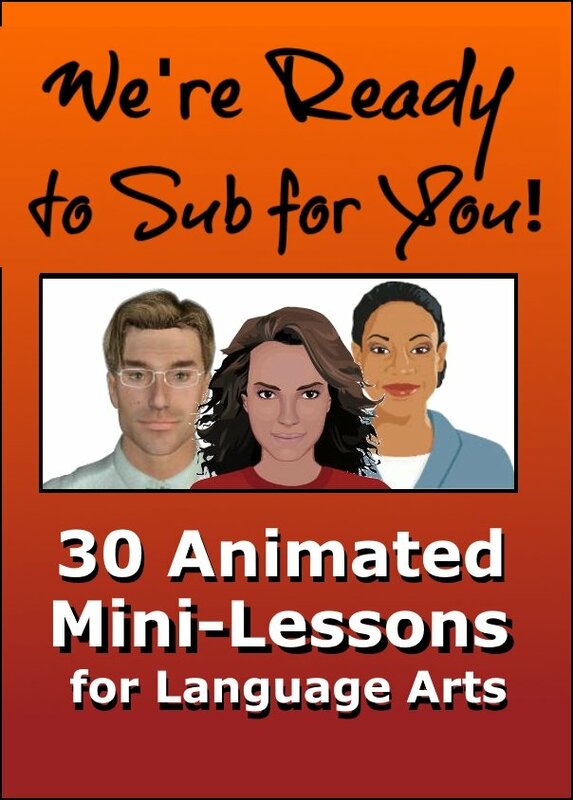 If that is not possible in your school district, please ignore this set of suggestions. Teach students how to underline effectively so that they may be able to increase their comprehension. Introduce the strategy by giving the students these key points: read the entire text before marking; be very selective about what and how you mark; and be quick and neat. Introduce the students to a system that they can use. Paulk (1994) suggests that kids draw double lines underneath main ideas and single lines underneath supporting details. He also suggests that students circle key words or terms and jot brief summaries in the side margins. Model this system continually and allow plenty of opportunities for independent practice with feedback. 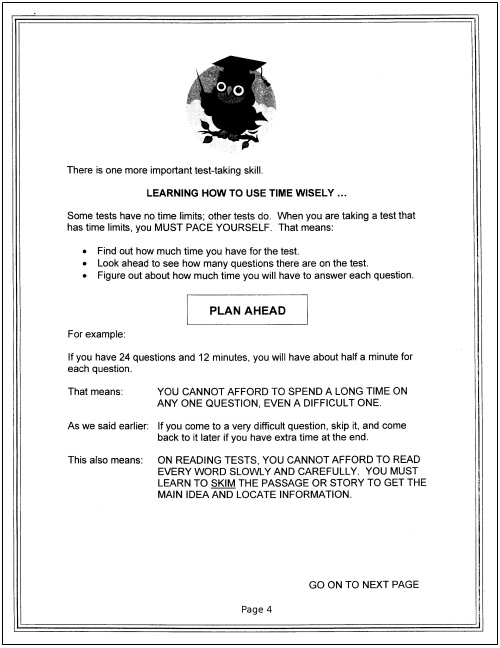 Beginning at this point of the tips for test taking page, I am introducing screenshot examples of PDF documents intended to be distributed to kids. 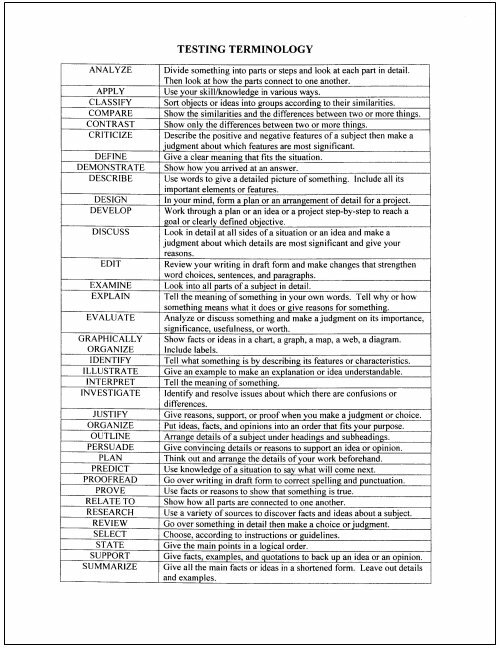 Also, I'm including a chart of testing terminology for your convenience and reference. Because screenshots are much smaller versions of the original documents, you may have difficulty reading the text. However, you'll probably have a good enough idea to make a decision about whether you would like to download this tips for test taking package. This is the QAR testing strategy for kids. This is the testing terminology chart for your reference and convenience. All of the tips for test taking documents represented by the screenshots above are available in one PDF package, which I am offering completely free of charge. Or, how about grabbing a T-shirt or coffee cup at The TeacherMarket? Potato feathers! If you really want to go all out, purchase one of my software products! In the meantime, you may download the Tips for Test Taking package here. Hopefully, the strategies and activities included on this tips for test taking page will make a meaningful impact on your kids. If you and your kids have found this page useful, you may want to check out Homework Tips-- suggestions for students, parents, and teachers. Additionally, the Academic Tips page has several strategies to help students become better at actually BEING students.